First-person shooters are often laden with goals and objectives, but one always rises to the top: shoot and kill things. Chaos Theory Games clearly aren’t ones for convention, because their upcoming multiplayer FPS S.W.A.P has no guns and only indirect ways to destroy opponents. Strictly speaking, there’s no death, either, as all combatants are swift wee robots with jetpacks. The clue as to how these little robotic soldiers destroy each other is in the acronym. They launch projectiles that allow them to swap bodies, and do bad things with their stolen form. 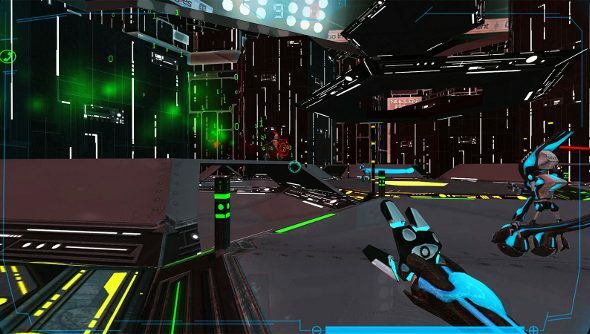 20 Arenas filled with traps and long drops are where these body-swapping bots duke it out. And battles are as much about aiming for those traps and jumping to one’s death as they are avoiding such things. After swapping bodies, a player can put their temporary host in peril by leaving them hovering over a trap before swapping back. The mechanic isn’t just a weapon, it allows bots to traverse the arena with greater speed by chucking their consciousness into other players near where they need to be. Objectives, too, can be nabbed this way. If an enemy is carrying the objective for their team, then you can just swap bodies and suddenly the object is now in your vice-like grip. S.W.A.P is in beta at the moment, which you can download here, and the developer has a server up and running 24/7.